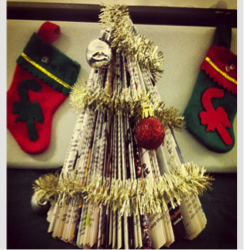 Magazine Christmas tree. Image retrieved from rd.com. Christmas is right around the corner and soon enough you’re going to need to start decorating and getting your gifts together. The hard part about that is knowing which decorations to put up or which gifts to buy. Every year you probably give or put up the same things, but this year could be your year to try something new. Here are some easy DIY gifts and decorations you can make in a snap. Looking for the right gift for that special someone? A little gift basket with their favorite things never harmed anyone. Be creative! Think of something they really love, like a selection from Starbucks for a coffee fiend. Get them a nice cup and fill it with their favorite coffee or tea. I’m not saying this is inexpensive, but it’s a simple way to say “I love you” without actually having to say those three awkward words. This gift cup can work for anything they like: candy, chocolate, make-up, etc. And this is not a gift that can only be given to significant others. This gift is also great to give to friends, best friends, mom, dad, or any other family member. Another simple gift you could give is food! Who doesn’t love food? If you’re tight on money (from buying all the gifts for that gift basket) or you just don’t know what to get someone, food is a great alternative. You could bake mini red velvet cakes (or any flavor cake you’d like) or festive Christmas cookies. Or you could give cute little food kits where you give all the ingredients and the receiver of the kit and they could make the food themselves, which could be a fun experience for whoever is receiving the gift. If you’re really lazy or forgot to get someone a gift, a simple candy cane or a few festive chocolate kisses shows that you care enough about that person to get them candy but not enough to actually put effort into a real gift. They’ll think you’re being nice by this small gesture, even though you really just forgot to get them a gift. Another favorite is the classic popcorn string garland for your Christmas tree. But it doesn’t have to be only for your tree. You could place your garland along the walls or your staircase or really wherever suits you. One other cute but simple decoration is just hanging out the fun, festive Christmas cards you receive from family and friends. It brings a festive look around your house and makes it feel a little Christmas-y even if it’s not. If you didn’t find anything you liked in this article or you would like to see other ideas, you can simply search “DIY Christmas decorations/gifts” for lots of other great options, brought to you by the Internet.